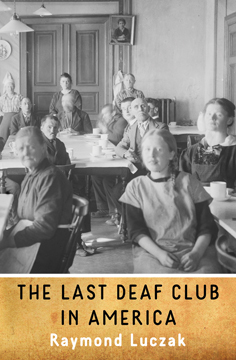 The Last Deaf Club in America. 5.25 x 8 trade paperback. The Deaf community today doesnt seem to be what it used to be, so a small group of people must decide whether to sell the last Deaf club in America. As its board of trustees reflects on what it means to be Deaf, a few ghosts return to share stories of what it was like when Deaf clubs truly mattered: Mabel Hubbard Bell, the wife of the Deaf communitys nemesis Alexander Graham Bell; Nellie Zabel Willhite, the first Deaf woman to earn a pilots license; Olof Hanson, the first Deaf architect in America; and George Veditz, a charismatic activist who defended the Deaf communitys right to sign. Raymond Luczak offers a compelling look into the Deaf community then and now. Raymond Luczak is the author and editor of over 20 books, including The Kinda Fella I Am and A Babble of Objects. He lives in Minneapolis, Minnesota.